I’ve always been a bit of a holistic health fanatic – always trying new things and doing extensive research into areas of well-being and nutrition. Now that we’re moving into fall, I’ve found myself wanting to let go of a lot of things, both emotionally and physically. 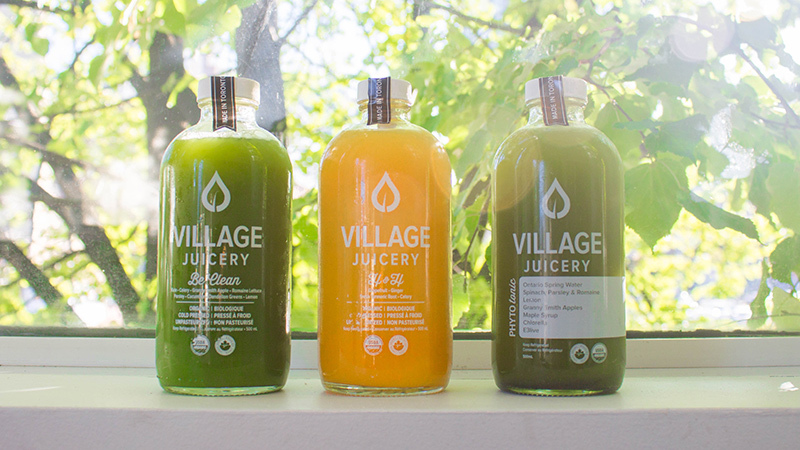 One could say I needed a little fall detoxing, and what better way to detox than through a juice cleanse with Village Juicery. 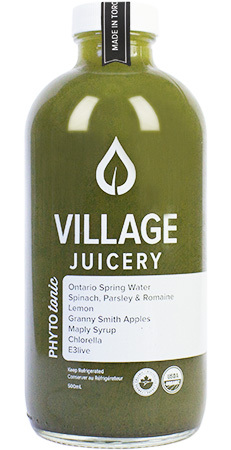 A Toronto based juice company, Village Juicery makes organic cold pressed juices, plant based foods, and personalized cleanses. Each cleanse is personally designed by a nutritionist, allowing the body to rest and reset the digestive system and detoxify the body. There were a couple reasons why I really wanted to cleanse. I have always had difficulties with my digestion, from continuous bloating to food sensitives, therefore taking part in this type of cleanse would let my digestive tract rest and heal. I realized that in doing this cleanse, it would also be a great time to confront my dilemma with food – that at times I can be overly attached to food, leading to emotional eating (when stressed) or bingeing (when feeling deprived). Due to some of my issues with digestion and hormones, I also wanted to do something that would promote balance in my body and my skin. And since digestion is directly related to skin health and immune function, cleansing my body would hopefully aid in clearing my mild adult acne (because let’s get real, no one likes breakouts). 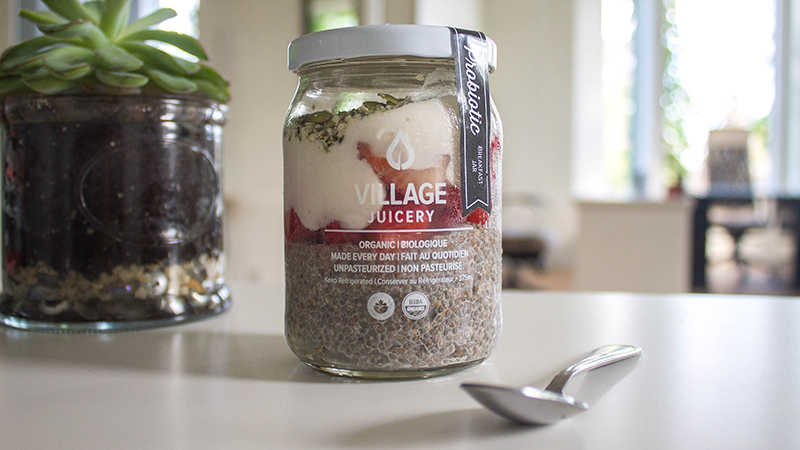 So here it is, my five-day juice cleanse experience with the Village Juicery. 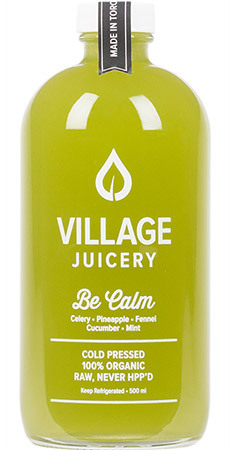 I loved that Village Juicery provided one-on-one consultations for their cleanses. I had the pleasure to speak to the lovely holistic nutritionist Marcelina, and after discussing what I specifically wanted to get out of the experience, she specifically catered the cleanse to my needs and wants. She asked questions about my overall health and well-being, and even took into consideration my dietary restrictions and food/juice preferences. It was especially nice to know that I could e-mail her at any point for support or if I had questions (and not to mention, she was incredibly lovely). Good morning world! It felt just like Christmas waking up to the boxes of goodies at my doorstep, and in these boxes were my food and juices for the next three days. I originally had the option of getting them delivered to my work, but being the urban-chic chick I am, I knew I would be bouncing around the city. What I had also found extremely helpful was the personalized cleanse guide that gets sent to you, allowing one to see their juice plan for the day, as well as helpful cleanse tips and advice. By the time I had gotten to work, I was ready for my probiotic breakfast jar. This delicious beauty was grain-free, high in fibre, and great for digestive health. It comprised of coconut yogurt, chia seeds, hand-made sunflower seed milk, strawberries, pumpkin seeds, hemp hearts, and vanilla. Super tasty and light in flavour, the strawberry brought a perfect touch of sweetness. It filled me up right away that I had to go back for seconds later. It was definitely a great way to start the morning. By mid-afternoon, little did I know that I was going to drink one of my new favourite beverages: Phyto Tonic. A sweeter green drink, it is super light, refreshing, and delicious! This tonic is a fortifying beverage of spring water, cold pressed juice and the earth’s most potent herbs and superfoods. An all-natural, organic boost for feelings of vigor and well-being. Some of its key ingredients include: Chlorella, E3live, and Phytoplankton. Throughout the day I had a total of three juices, two booster shots, one breakfast jar, and a plant protein salad. I felt more than satisfied for the entire day, and astonishingly enough, my energy was great. I woke up this morning feeling energized. I started my day with a Get Ready juice (alkaline water, lemon, cayenne) and my all-time favourite booster shot E3Live. E3Live is blue-green algae that promotes mental clarity, while aiding in the health of your hair, skin, and nails. Surprisingly, I found myself satiated from the juices the entire day. Not only satiated, but I thoroughly enjoyed the refreshing palette of flavours; from the green juices to the energizing grapefruit blends. Today was an interesting day; though I did not find myself hungry, I most certainly missed the act and comfort of chewing and eating. I didn’t have food to fall back on when I was bored or anxious. Today allowed me to acknowledge and understand my own personal relationship and attachment to food, both physically and emotionally. I spent the late morning and afternoon running some errands with the other half, and found myself ready for a nap by mid-afternoon. I was forewarned about detox symptoms of headaches and fatigue, and I most certainly began to feel them past lunch. My body temperature also dropped, so I made sure to dress cozy. By the end of the evening, the one thing I came to realize was that there was more than enough juice to last me the entire day. So for those who feel like they wouldn’t be able last a day, from my personal experience, it’s more mind over matter. Though I am a petite person, I can most certainly say I have quite an appetite. What I had noticed is that I had a difficult time finishing all the juices, at times I would find myself quite content or full. Personally, I don’t think the challenge is the physical aspect of not eating or starving yourself (there are plenty of nutrient dense elixirs to satisfy the body), but more so the mental strength and willpower of detaching yourself from the idea of “food” for a few days or so. Don’t be deceived by its black colour — this tonic is super light and refreshing. With the perfect hints of citrus, it leaves you feeling revitalized and rejuvenated. I absolutely loved the way it made me feel afterwards. 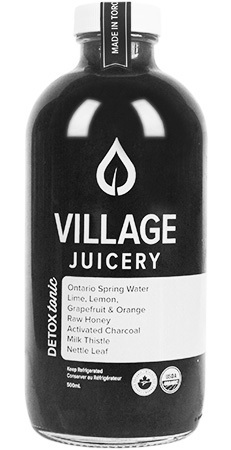 The Detox Tonic contains Ontario spring water, lime/lemon, grapefruit, orange, activated charcoal, milk thistle, and nettle leaf. Activated Charcoal: Virgin coconut shells are burned at high temperatures to create a highly absorbent carbon with millions of tiny pores that bind to help eliminate substances in your sytem. I had a wonderful morning, I felt energized and refreshed. I started off with Be Ready and an E3Live once again; I’m really loving the alkaline water blend, it’s a really great hydrating fix first thing in the morning. However, later throughout the day, I started to feel different. I had to place my ego aside for a moment. Though I knew I could’ve pushed myself to go the entire day on juices alone, I decided to listen to my body and I had a simple raw salad. It was a good lesson: listen to your body and cultivate that self-love and care. At the end of the day, this cleanse is designed to be a positive experience – “a treat to yourself,” as Village Juicery would say. In the evening, I practiced vinyasa yoga and it felt amazing. I was surprised at the amount of energy I had and the lightness I felt. I had the ability to seamlessly and effortlessly, get to poses that usually would require more effort. By day three I felt I had cultivated a heightened sense of mental and physical awareness. Instead of focusing on food throughout the day (and the stresses that come along with that), I was able to really focus and stay present on what was happening in the current moment. Delicate in flavour, Be Calm was one of my favourites to have in the evening. The go-to juice when you want to press pause and take some time to focus on your body’s center; it’s building blocks are celery, pineapple, fennel, and mint which create a sweet, cooling, and earthy base. It is a hydrating source of iron, calcium, magnesium and manganese which are commonly deficient among Canadians, while also being high in vitamins A, C, and K.
I woke up bright and early – but unfortunately, I still managed to sleep through my alarm, missing my 7am yoga class. Which is another great learning lesson while on a cleanse: give yourself more than enough time to get a really great rest (it will make it quite easier to wake up in the morning). And once again, it was like Christmas morning – I got my lovely juices delivered to me for the next two days. I loved getting it delivered to my home. It allowed me first thing in the morning to pop my first booster shot and hydrating juice down, making me feel great and ready to kick start my day! It was a great productive day in the office. But once again, my body started feeling exceptionally cold. Thus, I treated myself a warm cup of organic vegetable soup. I usually turn to warm broths or herbal teas during cleanses when I find myself getting extremely chilly. It’s also super helpful to always have a large comfy scarf nearby! A colleague of mine had commented on my juice cleanse glow. I did start noticing a difference in my skin, especially with the days to follow after the cleanse – less breakouts and reactions, yay! The most successful cleanses I have done in the past have always involved eating more mindfully post-cleanse. For those of you who aren’t a huge fan of green juice, meet your new best friend: Be Nourished. 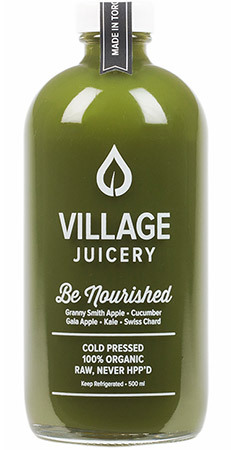 Let it be the gentle introduction you need, made with granny smith apple, cucumber, gala apple, kale, and Swiss chard. An excellent source of vitamin A, C and K, it also contains B-6, thiamine, riboflavin and folate without ever twisting your cheeks. High in Magnesium, manganese, and a great source of iron, it’s a perfect balance of dark greens with apple to bring sweetness. Today I got to reintroduce food! I was super excited, but a part of me also wanted to continue another day or so juice cleansing – simply because the juices were that good, and they made me feel amazing too. The reset day included 3 juices, 2 shots, one probiotic breakfast jar, and a living energy salad. By the final day I had recognized a substantial shift in my mood and energy. I felt like I was on top of the world, it was a great feeling. My usual energy levels were more stable throughout the day; I didn’t feel like I was suffering from those mid-day slumps. Given that I hadn’t really eaten in the last few days, I wasn’t experiencing any usual bloating or digestive discomfort. Overall, I thoroughly enjoyed this juice cleanse. Out of all the juice cleanses I have done so far in Toronto, I would definitely have to say Village Juicery is my favourite. Not only does their cleanse offer a wonderful variety of juices, they also offer food options to supplement the pre-cleanse and post-cleanse stages. Additionally, having a personalized cleanse plan developed by their in-house holistic nutritionists is a major bonus. It is a great way of getting expert advice and support for your juice cleanse journey. Even though this particular cleanse does offer a preparation and reset day before and after the food elimination days, I would still highly recommend preparing your body well ahead time. Aim to eat cleaner foods a week before the actual cleanse, and consider incorporating some juices into your diet ahead of time. From my experience, it’s less of a shock on the body while on the actual juice cleanse. I think my biggest piece of advice overall is: Don’t be too hard on yourself. Let this cleanse be a way of showing your body some TLC, and if you have to eat something, listen to your body. Happy juicing friends!